2ft Double Dog Coupler built with climbing rope & 316 stainless steel clips. Optional carabiner & nanoSwivel available. Double Dog Coupler built with CE rated climbing rope and marine grade 316 stainless steel swivel hooks. The reinforced eye and customized industrial connectors make this a strong and durable coupler. Having two dogs is twice the fun, but walking both at the same time can be a challenge. A coupler can help safely walk both dogs. 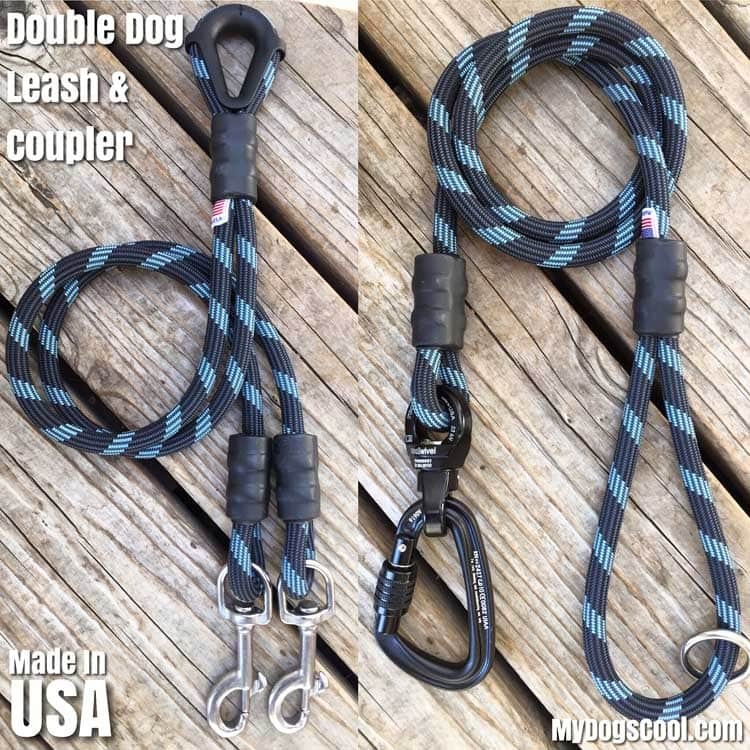 This 2ft double dog coupler can be used with most any dog leash equipped with a carabiner. A standard size clip will not fit the reinforced eye on the coupler. An optional swivel carabiner as seen on our Double Dog Leash Coupler is a perfect upgrade for extra large dogs. Depending on your height, and size of your dogs, we find that this 2ft coupler works well with a 4ft leash and carabiner. A longer leash may allow the coupler to come in contact with the ground. This coupler is only intended to be used in helping walk two dogs together. Although it might be fun, the coupler is not designed to be used as a means of attaching dogs to sleds, wagons or similar. 2ft Double Dog Coupler designed with your choice of climbing rope, two 316 stainless steel swivel clips, reinforced coupler eye and customized industrial connection points securing the rope ends. Select the Length of your Double Dog Coupler. 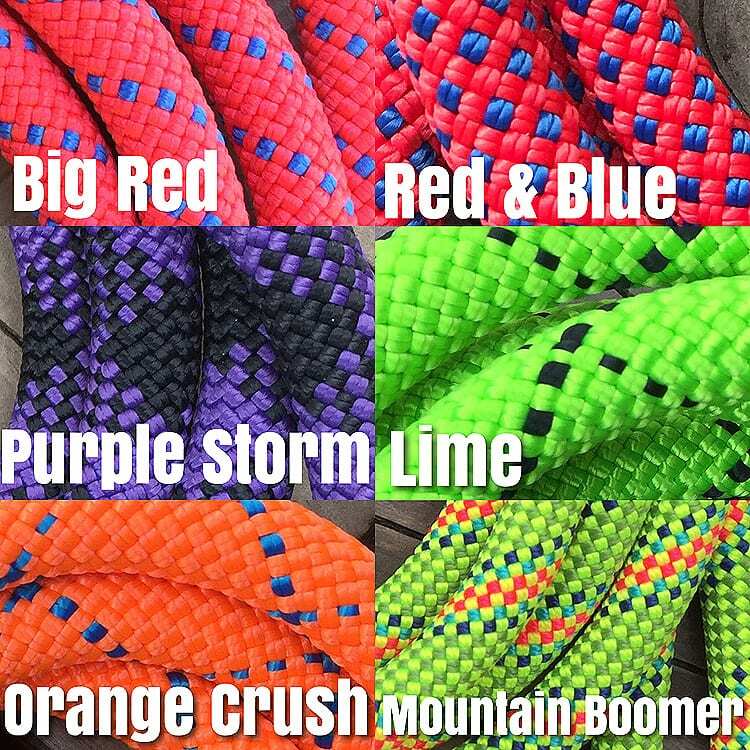 Select the Color of your Double Dog Coupler. If the color you prefer is not listed in the drop down menu, it may be out of stock. Ask us to double check, we're happy to do so. This option upgrades the coupler with a set of Professional CE rated locking carabiners and nanoSwivels, carabiners only, or two Quick Release connections. These will replace the stainless steel swivel clips. If your dogs are large to extra large, and pull exceptionally hard, this upgrade may be for you. Please keep in mind that Carabiners by themselves will not swivel, and may result in a tangled coupler or leash. Quick Releases have a spring loaded release pin that's often used when a "quick" or fast release is necessary. NanoSwivels or stainless steel clips are typically the best choice. Black Locking Carabiner unattached and not required. Often used to connect an existing dog leash to the new double dog coupler. •Requires a dog leash equipped with a carabiner.